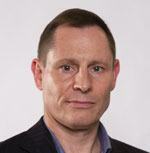 Dr Fox is owned by the UK registered company Index Medical Ltd (company no. 6797903). We employ only experienced GPs working in the NHS. Our doctors are registered with the General Medical Council. The despatching pharmacy is named on the medicine label. Read further information on how we are regulated. We provide consultations and issue private prescriptions online. We arrange on your behalf for private prescription to be sent to a pharmacist for dispensing and postage. We provide accurate easily understood information about conditions and treatments. Doctors are available to discuss treatments before, during and after consultations (contact details). We provide follow-up for side effects and other issues arising from treatment. Where you agree, we keep your GP informed. Index Medical Ltd is registered with the Care Quality Commission to carry out consultations and provide prescriptions online (registration no. 1-101728017). Medicine is dispensed and posted by recorded delivery from our UK registered pharmacy. Read further information on how we are regulated. See our patient guide for further details about the service and how to make a complaint, and also our aims and objectives. Dr Fox takes a precautionary approach to prescribing. 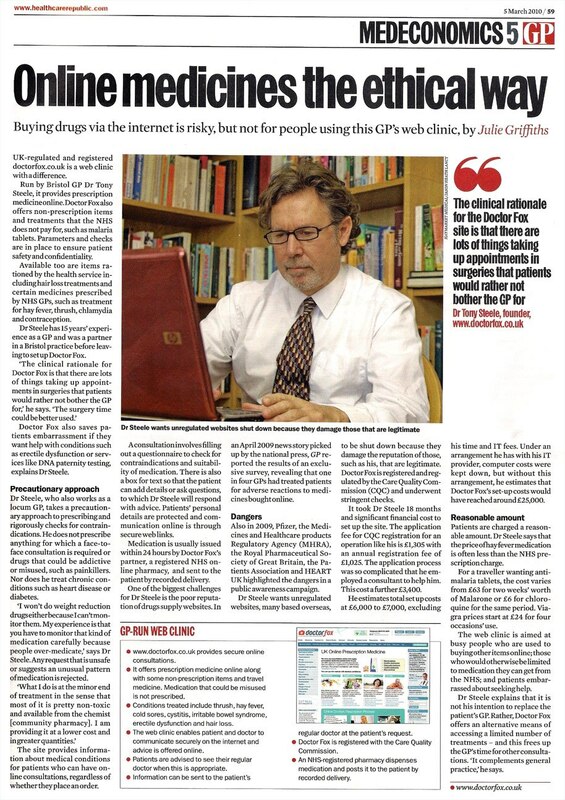 Where we cannot be confident a medicine can be prescribed safely online, we will not prescribe it. We do not prescribe medicine that is addictive or likely to be abused. 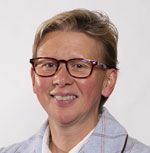 Dr Fox gives clear information and guidance and provides links to authoritative medical websites including the NHS website. We provide links to data from clinical studies for those interested in this level of detail. A person obtaining prescription medicine through Dr Fox will know about the condition being treated. They can be sure the medicine dispensed is right for them and is genuine. Through our clinic we aim to enable patients to exercise choice and engage in their own care. At the same time a small part of the burden on the NHS is being relieved. Online clinics are a safe and convenient way for people with busy lives or people with mobility difficulties to obtain prescription medicine. 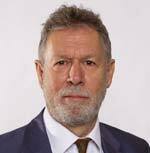 The doctors responsible for developing the consultations provided by Dr Fox have over 25 years of NHS experience. We are committed to providing services of a high standard and to treating patients with care and respect. 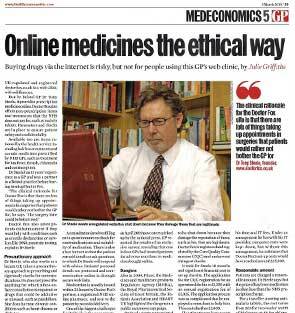 Read more about the service as reviewed in an article by GP magazine: Online medicines the ethical way. Dr Fox receives no funding and does not permit advertising. The online clinic service of Dr Fox does not replace your GP. Dr Fox issues prescriptions for conditions including malaria, traveller's diarrhoea and jet lag where treatment on the NHS is not available. We provide private prescriptions for medicines to treat some conditions such as erectile dysfunction where treatment on the NHS is rationed. 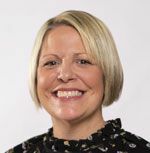 Medicines for conditions including hay fever, thrush, cystitis, cold sores and travel sickness are prescribed and dispensing arranged by Dr Fox safely at affordable prices. We do not carry out online consultations for conditions where face-to-face consultations are required. In situations where questionnaire answers suggest there is a need, we advise patients to see their regular doctors and do not provide a prescription. Our doctors are experienced GPs working in the NHS and work as part of a team at Dr Fox. See Our team page for further details.